Dramatic ice skating dress with plunging sweetheart bodice, and deep, curvy back! Narrow shoulder 'straps' and 'open' back in suntan mesh shows off your lovely back. Beautiful, sleeveless ice skating dress will make you stand-out! Two-layer, mesh ice skate skirt has just a touch of fullness. Stunning crystals accent this beautiful design! AB crystals edge the plunging 'v' shapes front and back with accents of siam (red) crystals along the way. 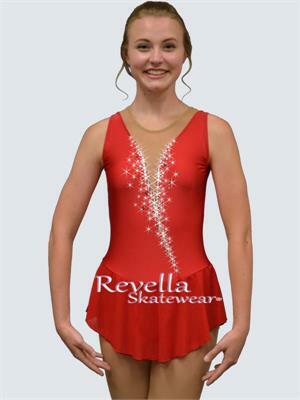 Ice skating dress shown in scarlet (red). Also available in coral, shocking pink, purple, and black. Want a different color? Simply choose 'custom colors' from the drop down menu, then select the color you want from our optional color choices below. Optional colors are available on all of our ice skating dresses. Search terms: sleeveless, red ice skating dresses, black ice skating dresses, bold, classic, competition.